Junonias are deep-water shells and hence rarely found intact. When a collector is fortunate enough to do so, it is celebrated in areas where large numbers of shells are found. 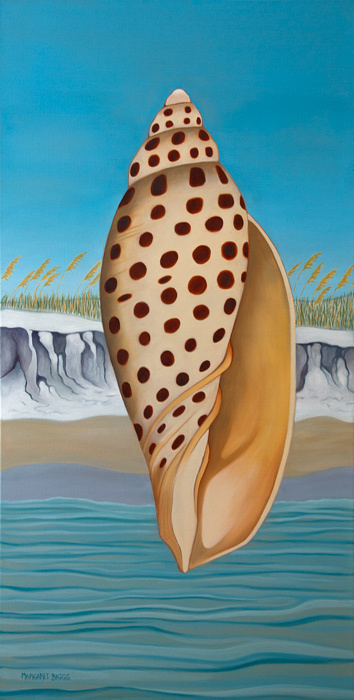 This painting depicts the Junonia subspecies found only off the coast of Alabama and Northwest Florida. It’s coloring is as painted, a pale yellow/gold with dark spots, as opposed to the off-white body most collectors are familiar with. I painted her floating off the North Gulf Coast. A small sand cliff is in the background with sea oats gracing the beaches above.